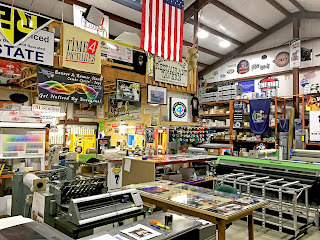 Time4Printing has become a household name for printing of all types, from letterhead to stickers. Time 4Wrapz is known for dazzling graphics on vehicles, but now with new technology and training, they can also be known for dynamic signage that will grab the attention of clients and draw them in. This summer, the Time4 staff traveled to Las Vegas for a conference and training expo where they found a new printer that will expand their offerings exponentially, according to owner and wrap master Niels Mank. “We went to get trained in the newest and most innovative technology and bring that knowledge back to our customers in Maine,” said Mank. “The new hybrid UV printer opens up a whole new world for our customers. They can print on canvases, mirrors, custom wooden pieces, metal and plastic. Basically, any material you can fit into the machine,” he said. The hybrid UV printer uses UV light to dry the ink put on top of the item. The special ink used is also UV rated for fading from sunlight. Items that can be printed on vary, and even the team at Time4Printing is still experimenting with new materials. Time4Printing has done signs before, however now they print directly on the material instead of adhering the print to the material. Now the signs can be clear or highlight one aspect of the sign with embossing. The custom effects are limitless. The Las Vegas trip provided the team with more advanced training on vehicle wraps, exposed them to new technologies, tricks and products. The company was also chosen to be a test facility for 3M in product development. “Partnering with manufacturers helps the entire industry improve,” said Mank. “We’re quality driven. We’re not a wrap chop shop. If it’s not right, we’ll peel it off and do it again. It’s about the end product being the best it can be,” he said. The perfect wrap starts with the best design for the vehicle and the business. The design department is responsive to the needs and wants of the client and because of the equipment Time4Printing uses, the designs are limited only by the client’s imagination, and even then, they can help with marketing and branding. From basic one color lettering to a full color design with picture like quality, Time4Printing is ready to make a business stand out. Recently, Time4Wrapz, a division of Time4Printing, held its first Wrap Care Day, where clients were invited back to the shop to have their wrap cleaned and protected for free. “You need to take special care of wraps to make them last. It’s hard for our commercial clients to find time to do the routine maintenance. As long as they are cared for, wraps should last two years on horizontal surfaces and five years on the sides, according to 3Ms warranty. The same technology applied to the vehicle wraps can be applied to signs. “We can produce amazing graphics on signage for a fraction of the cost of other companies,” Mank said. Small businesses, realtors and tradesmen can use signs like yard signs, realtor for sale signs or a large backlit sign. Need a temporary banner that can be used time and time again, check out the extreme weather banners produced at Time4Printing in full color. They also do roll up banners and tradeshow displays. If you’re starting a business, or want your business to move to the next level, see Time4Printing to help with all marketing needs from business cards to vehicle wraps and signage. For more information, visit www.Time4Printing.com or www.Time4Wrapz.com or call 207-894-5600. Visit Facebook for the latest specials and samples of our work.